LuJam Cyber helps ensure small and medium organizations have cyber protection that is available, accessible and understandable. Running 60+ customer networks, LuJam needed to bring in enterprise threat intelligence to help stop zero-day attacks. The security provider decided to implement Farsight Security’s Newly Observed Domains (NOD) tool, which provides organizations with real-time actionable insights based on the newness of a domain—allowing them to proactively redirects users and block more zero-day attacks. 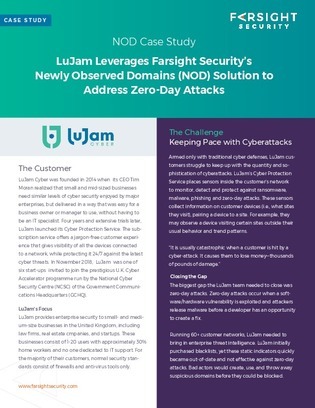 Learn more about how LuJam has strengthened security with NOD in this case study.